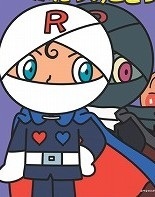 Melonpanna's older sister who has two hearts: A red one of goodness, and thanks to Baikinman, a blue one of evil. The sight of Anpanman can trigger her evil heart while the sight of Melonpanna can trigger her good one. She started out in the series as a loner at Baikinman's beck and call, but she broke from his power and wanders the world doing good deeds, but stays away from others for fear of what she would do if her black heart is triggered. Her nickname is "The tragic heroine". Uses a gymnastics ribbon as her main weapon. She can use it to wrap up her enemies or cause tornadoes.